to wake up to extremely small city cars. 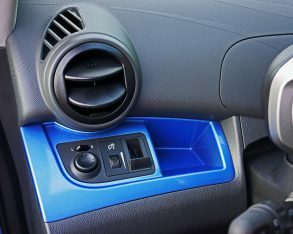 Such is not the case in many other countries throughout the world, such as Manila, Philippines where I’m writing this review. Sparks are all over Manila, as are a bevy of alternative city car competitors. 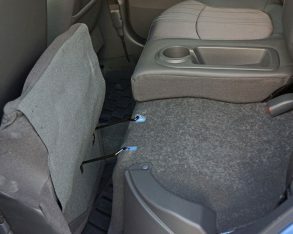 available either. 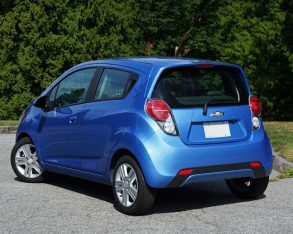 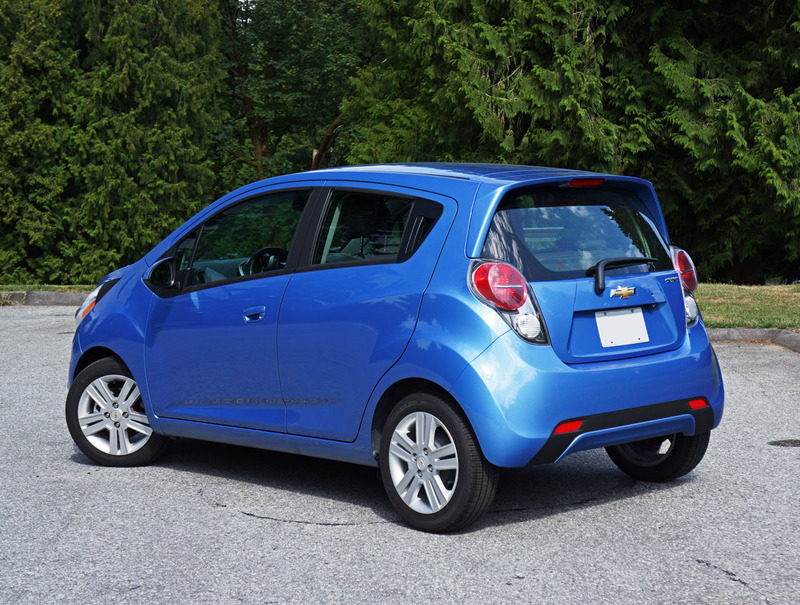 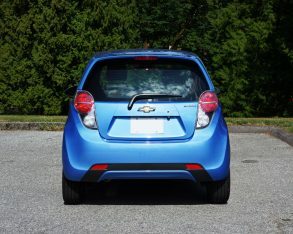 Just the same, considering the hefty competition Chevy’s Spark does very well in the Philippines, and there’s good reason. 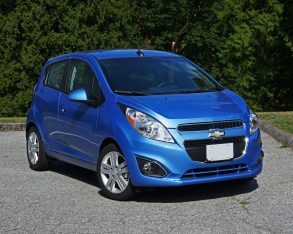 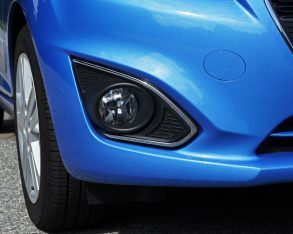 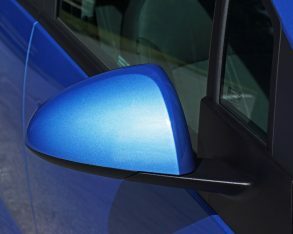 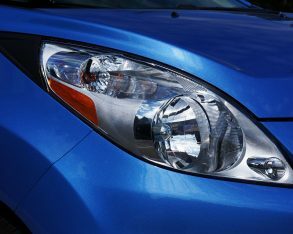 I’ve had the pleasure of driving a few Canadian-spec Sparks throughout the model’s short North American tenure, which while being available in other markets under various names since 1998, only started two years ago in the U.S. and Canada with the mid-2012 launch of the third-generation 2013 model. 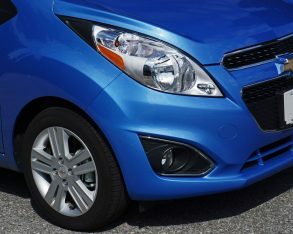 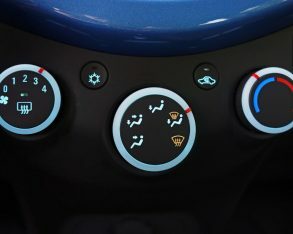 The first time was on the car’s official launch program where five-speed manual and automatic versions were available to test; the second was a four-speed automatic equipped Spark, and this most recent 2014 version features the all-new continuously variable transmission (CVT), an automatic that delivers more performance while achieving better economy than the outdated slushbox that came before. 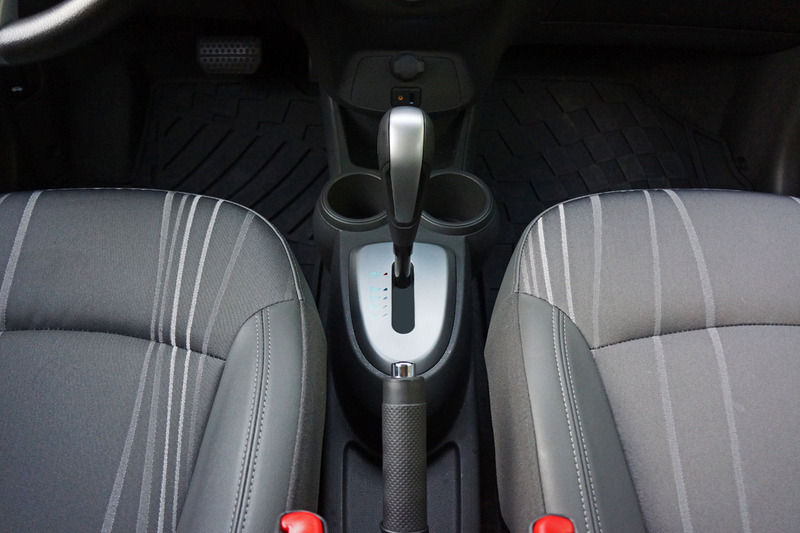 the old four-speed auto was the Spark’s only sore point. 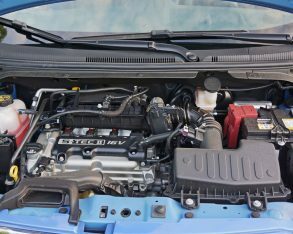 It worked well enough, but it forced the tiny 16-valve, DOHC, 1.2-litre four-cylinder engine to rev too high when trying to extract all of its 84 horsepower and 83 lb-ft of torque. 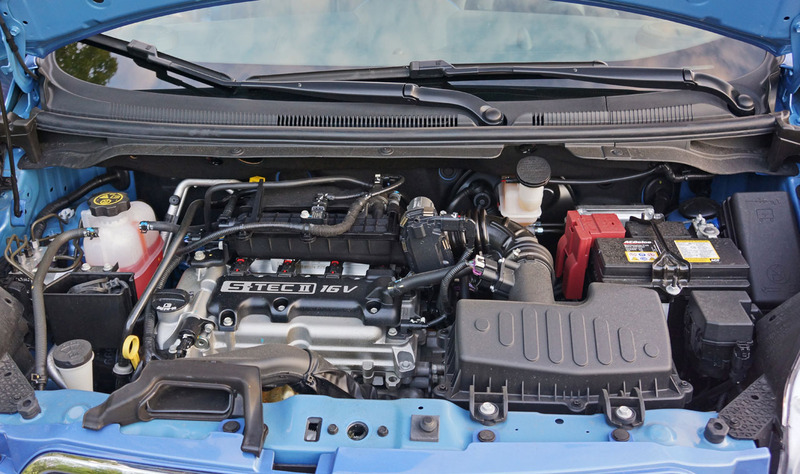 Such is not the case now, the CVT capable of maintaining a constant 6,400-rpm for maximum power or 4,200 rpm for max torque, depending on how you want to use it. 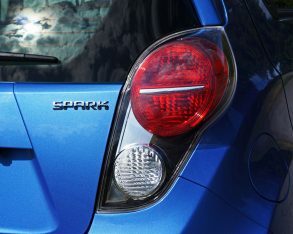 Granted the Spark’s little engine doesn’t exactly create stratospheric output levels, but after a little immediate hesitation off the line you’ll be surprised how energetic it feels thanks to a featherweight mass of just 1,029 kilos (2,267 lbs) in manual guise or 1,074 kilograms (2,366 lbs) with the CVT. 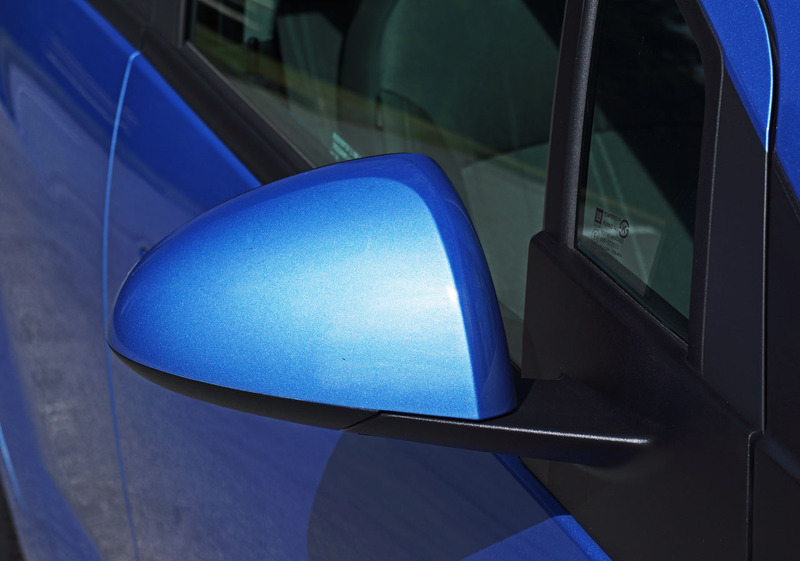 tall and narrow one-box shape made it a bit tippy amid fast-paced corners. 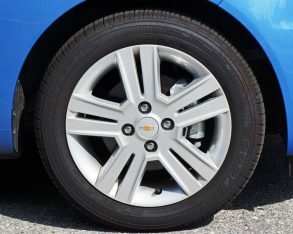 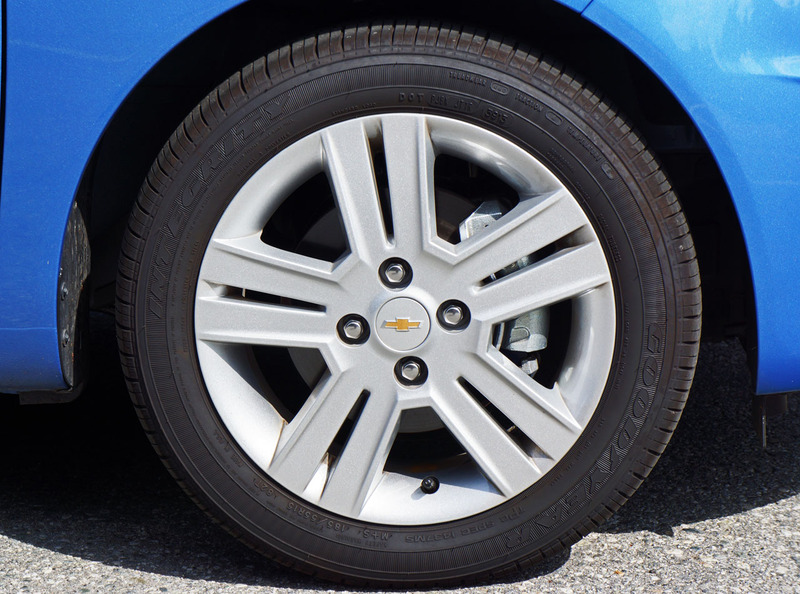 Braking ranks in the “good enough” class too, its front and rear drums not up to repeated heavy stomps while winding through backcountry roads, although the standard ABS worked perfectly during panic stops. 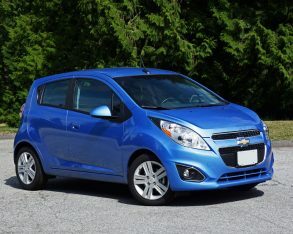 This said the Spark isn’t the kind of car you’ll likely be entering into the local autocross event come Sunday morning, but rather is ideal to get you to work and back each weekday and then across town with you and your friends/family aboard to visit yet more friends/relatives on the weekend. 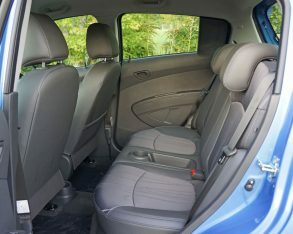 headroom, while the back seat is good for two regular sized adults along with a smaller one in the middle. 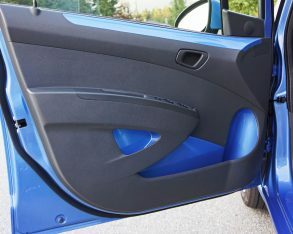 Don’t expect to be wowed with premium-level soft-touch plastics, but there are plenty of other things to get excited about. 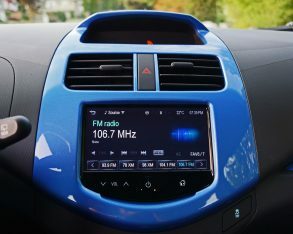 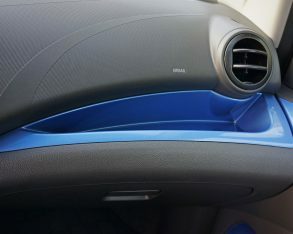 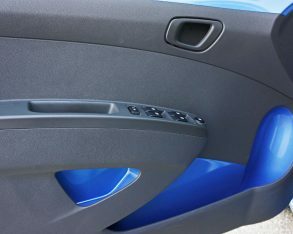 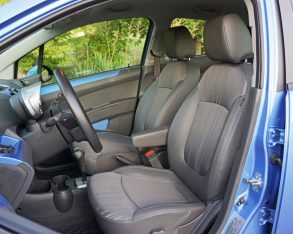 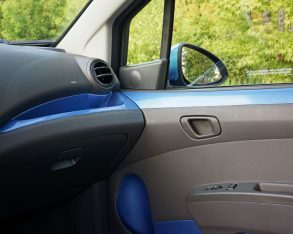 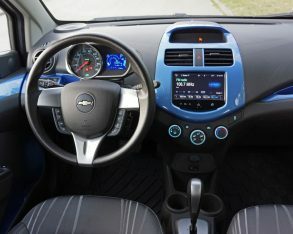 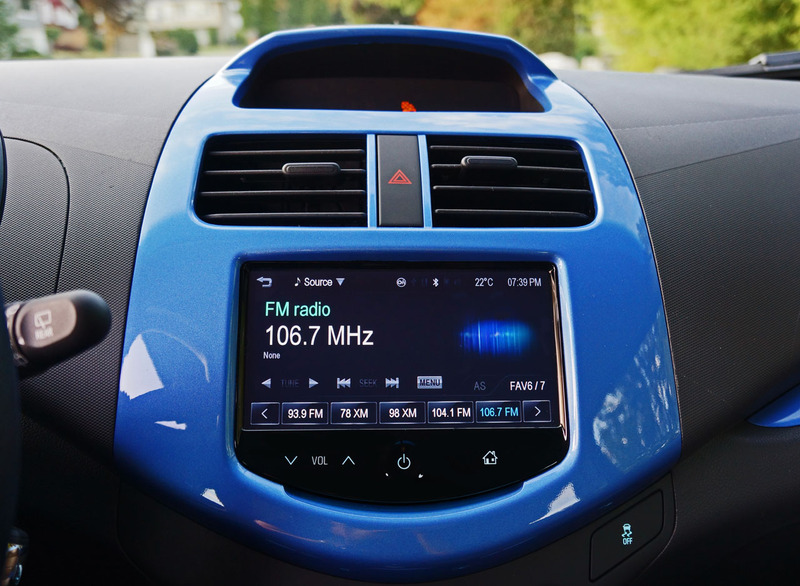 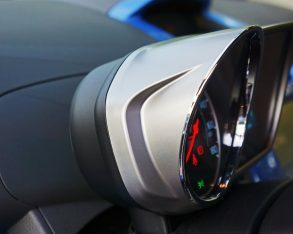 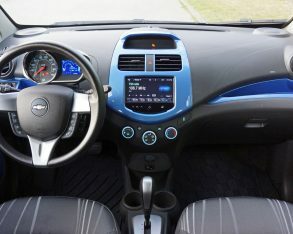 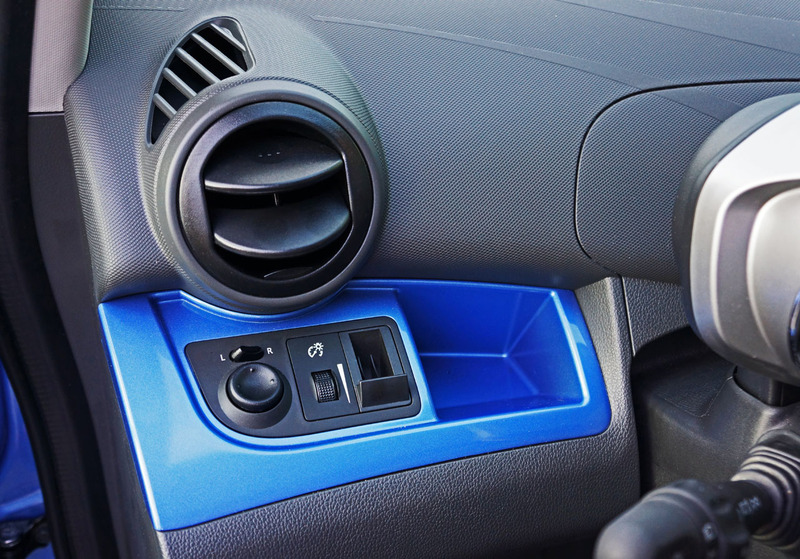 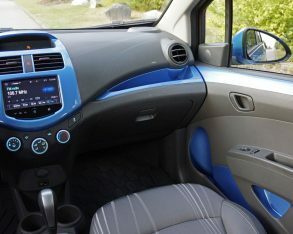 First off the overall design of the Spark’s interior is really inviting, with cool available body-colour accents across the dash and doors, mine finished in “Denim Blue”, plus a motorcycle-style instrument pod that sits atop the steering column, a really nice full-colour infotainment touchscreen display on the centre stack, and many other niceties thoughtfully placed throughout. 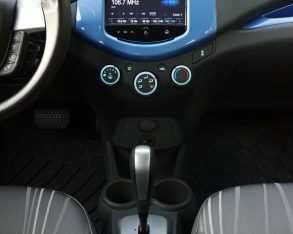 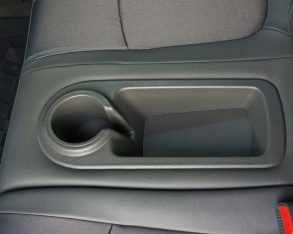 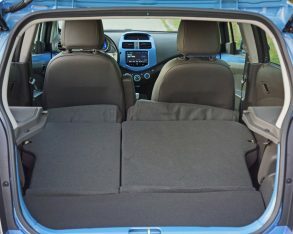 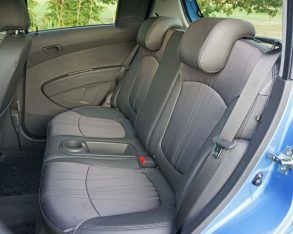 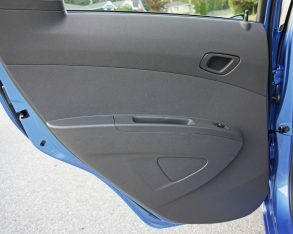 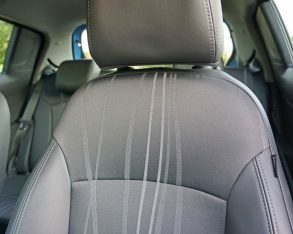 As already inferred, the cabin plastics look and feel bargain basement as do the seats, their fabric looking nice but feeling pretty cheap, but let’s not forget that the Spark sells for a very small sum compared to most rivals, so there’s no reason for beating it up for not passing itself off as a premium car. 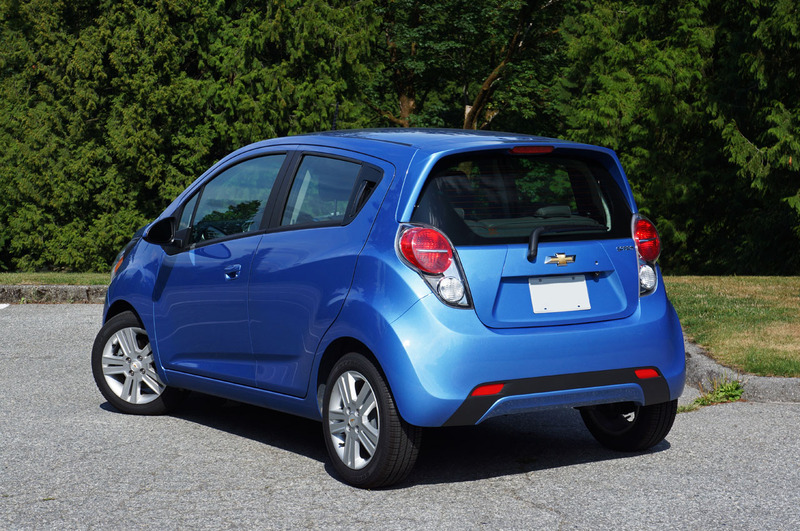 is a premium version of the Spark, mind you, dubbed LT2. 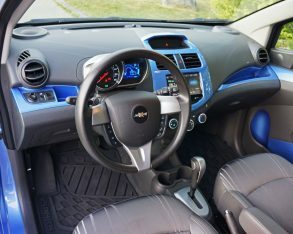 It comes with such upscale niceties as a leather-wrapped steering wheel, leatherette upholstery, heated front seats, body-colour power heated mirrors with integrated turn signals (new this year), body-colour lower rockers, 15-inch aluminum wheels with painted pockets, unique sport front and rear bumpers, a chrome finish liftgate handle, a chrome exhaust outlet, and standard fog lamps. 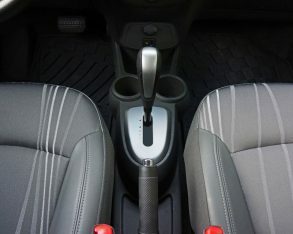 and pre-delivery prep, which is $1,450 more than the same LT1 featuring the base five-speed manual gearbox. 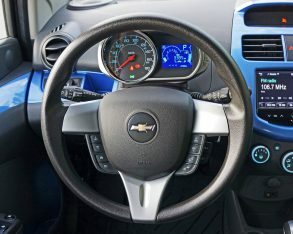 The LT2 I mentioned earlier will cost you $2,050 extra with the manual and $2,000 more with the auto, while a base LS manual carries an MSRP of $11,945. 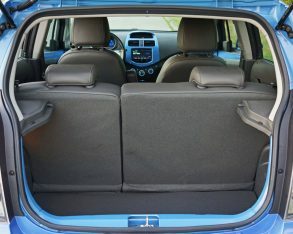 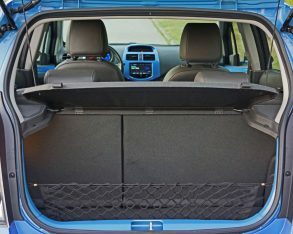 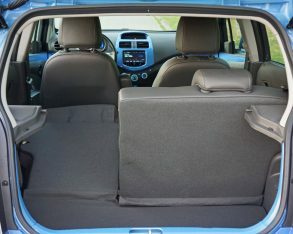 seats, a cargo net, an electronic immobilizer, OnStar telematics, body-colour door handles, 15-inch aluminum wheels on 185/55R15 all-season tires, a rear spoiler, plus driver and front passenger knee airbags as well as rear passenger outboard seat-mounted airbags added to the car’s complete menu of safety features. 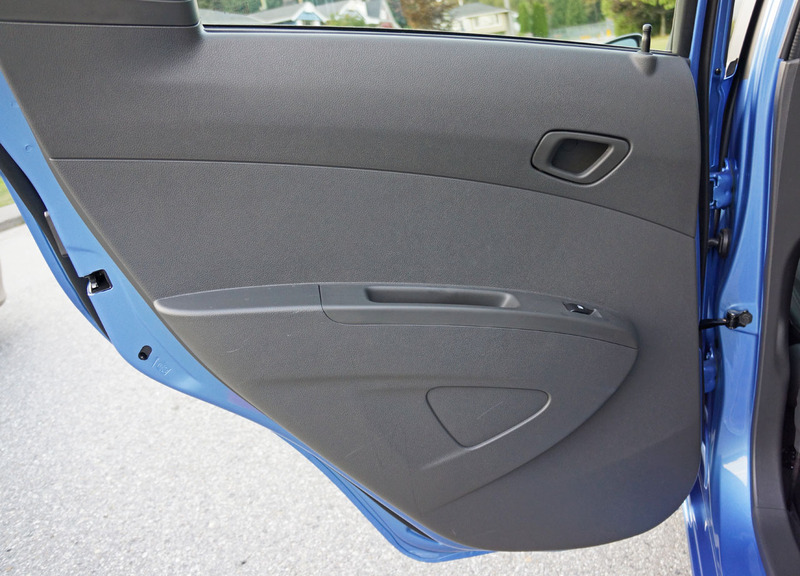 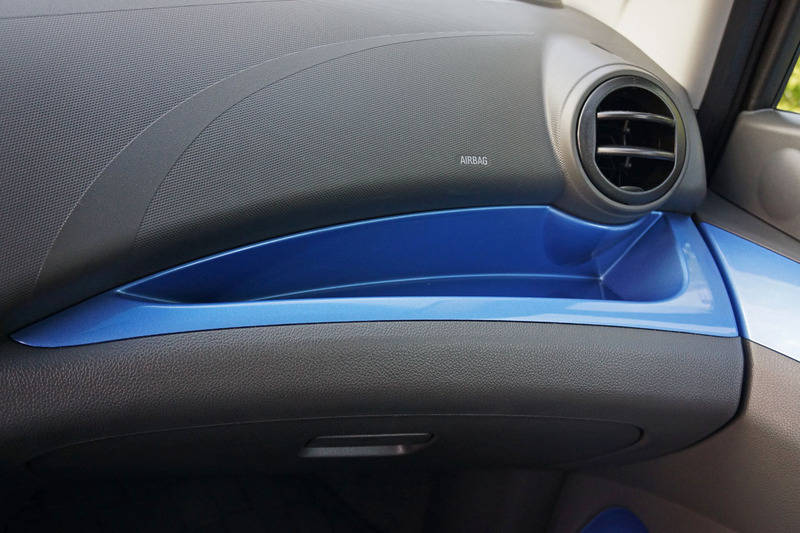 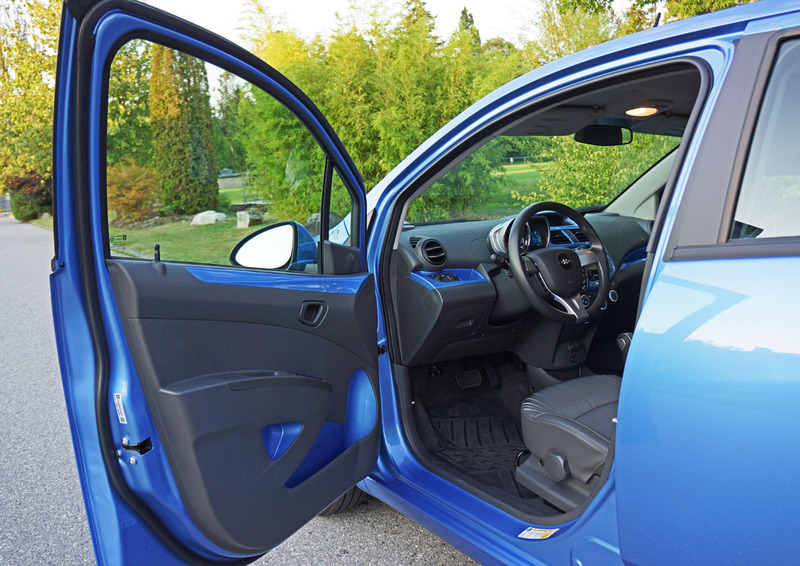 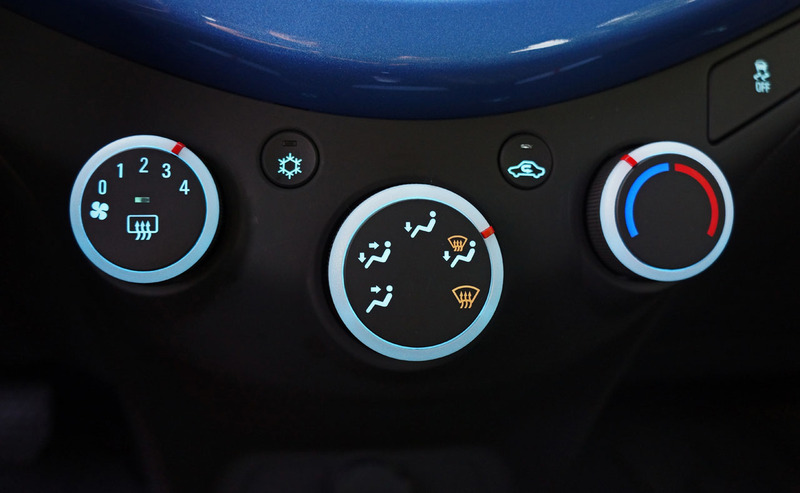 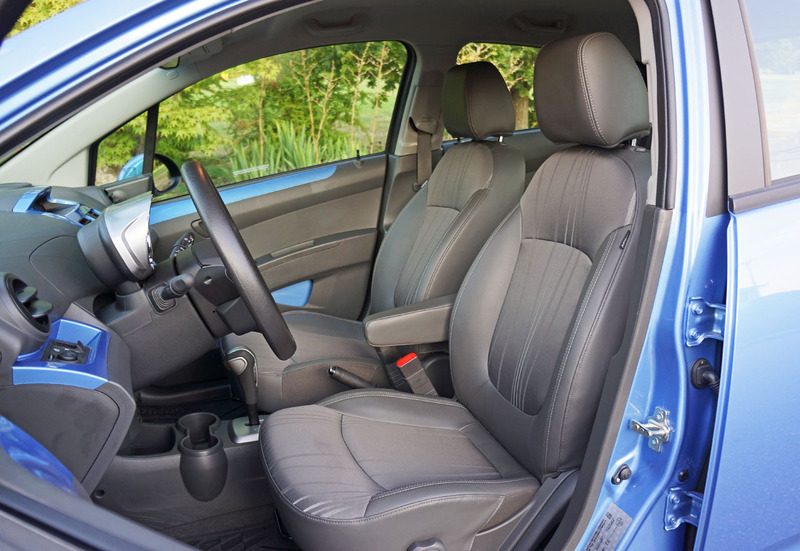 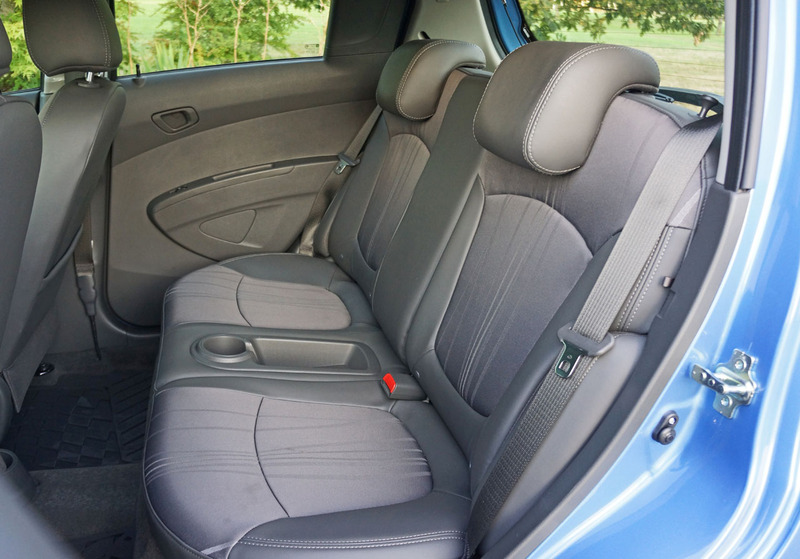 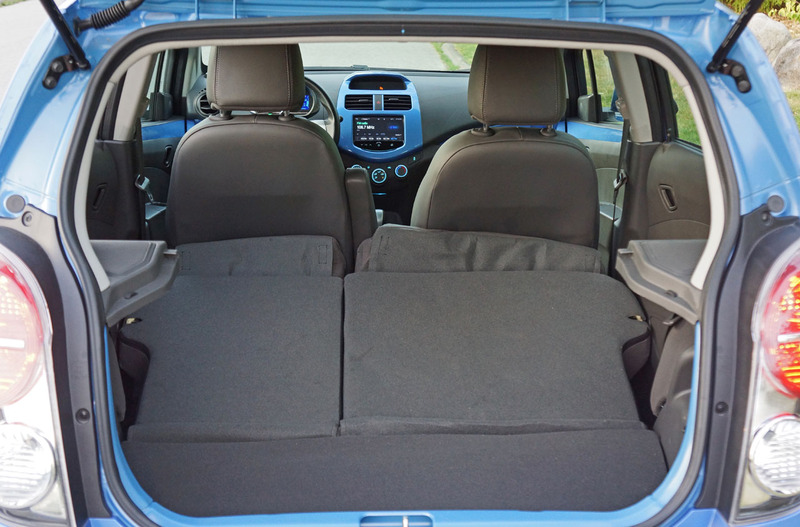 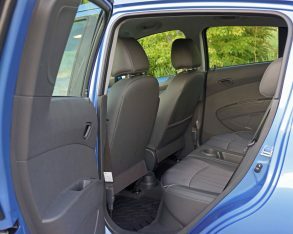 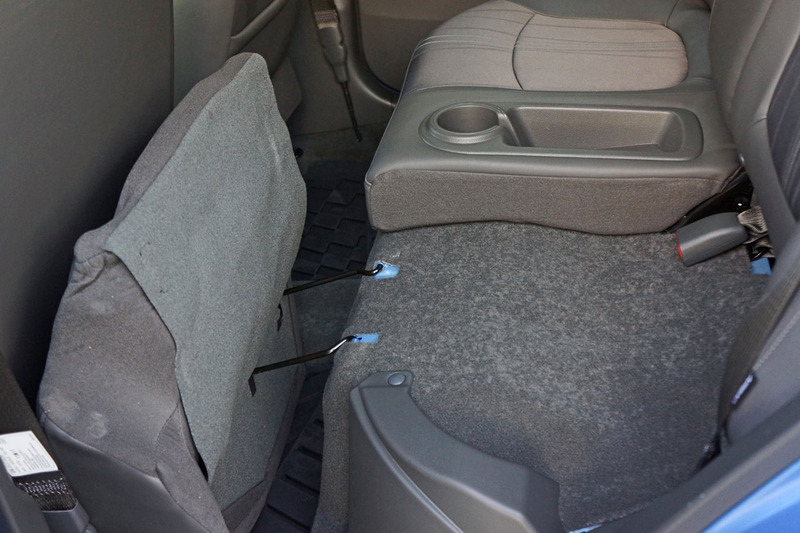 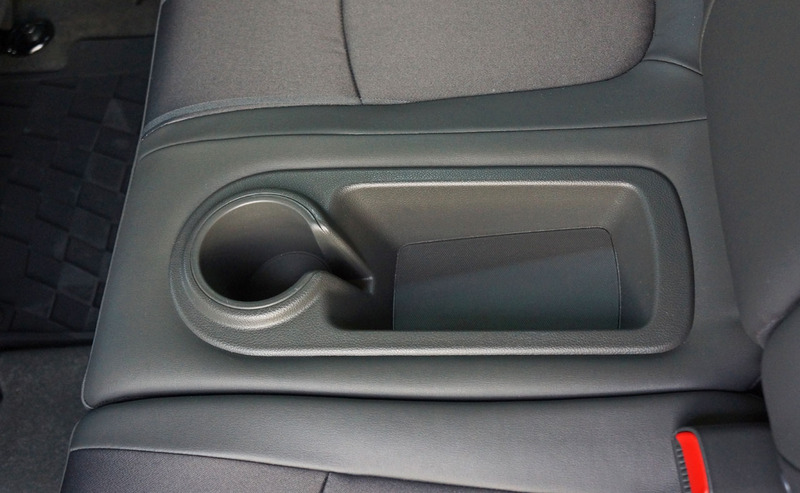 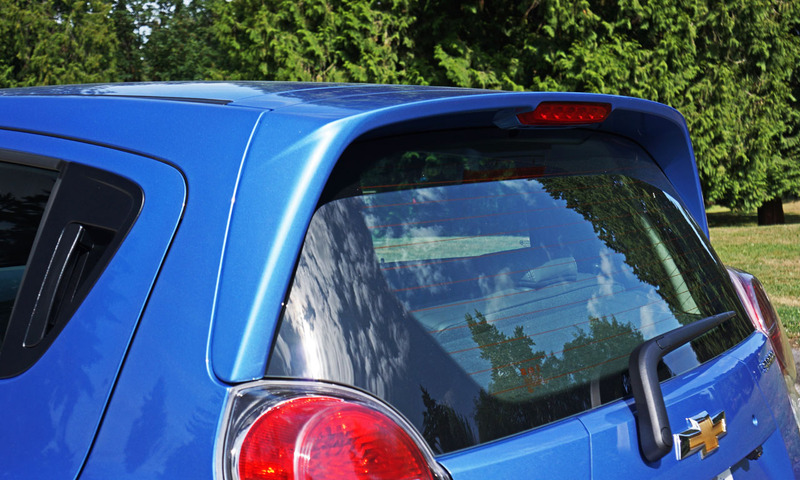 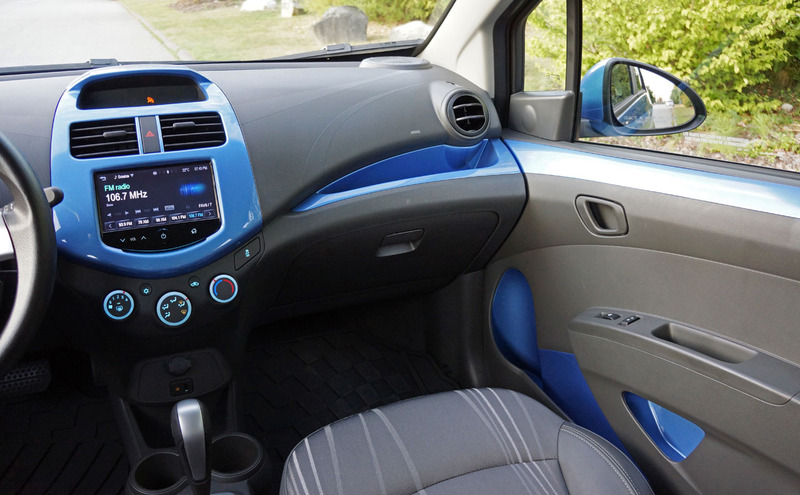 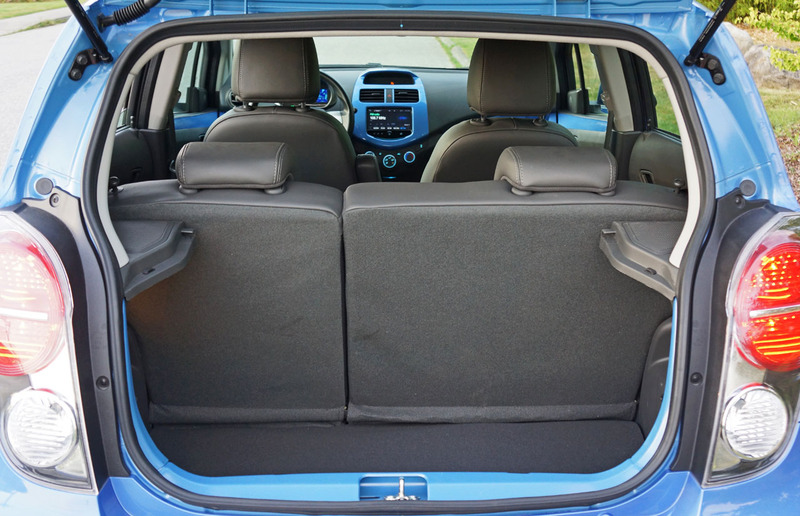 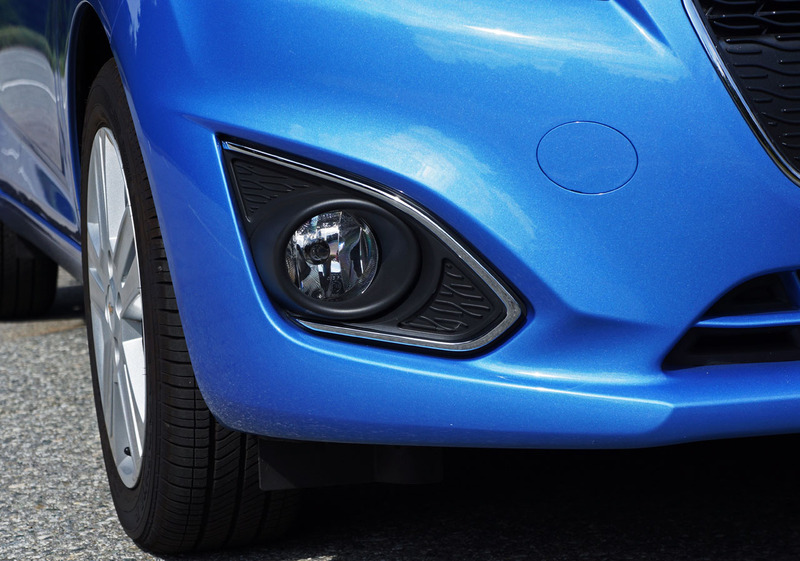 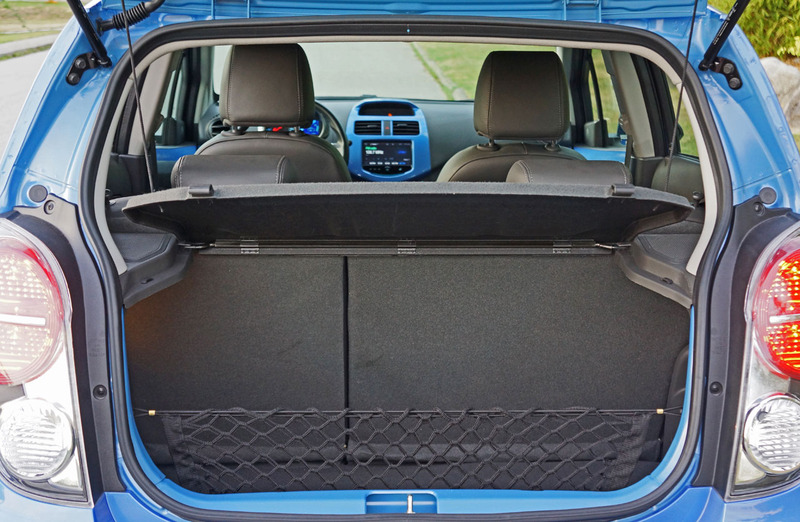 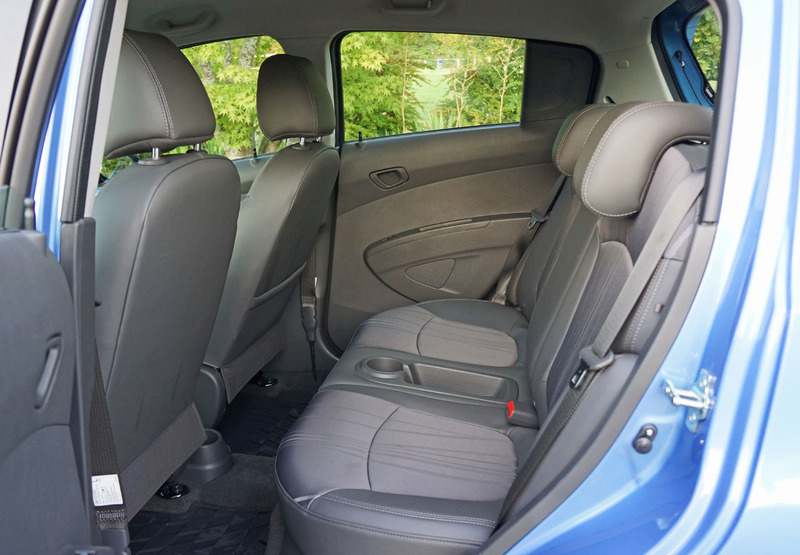 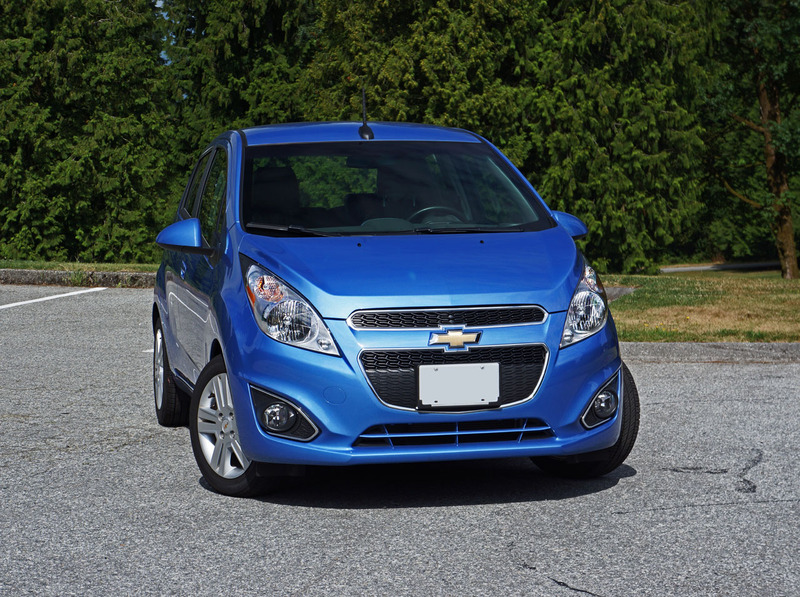 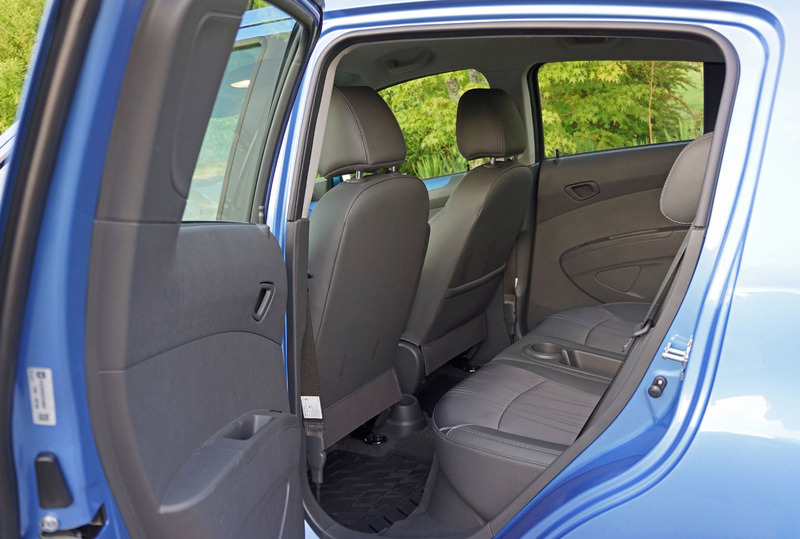 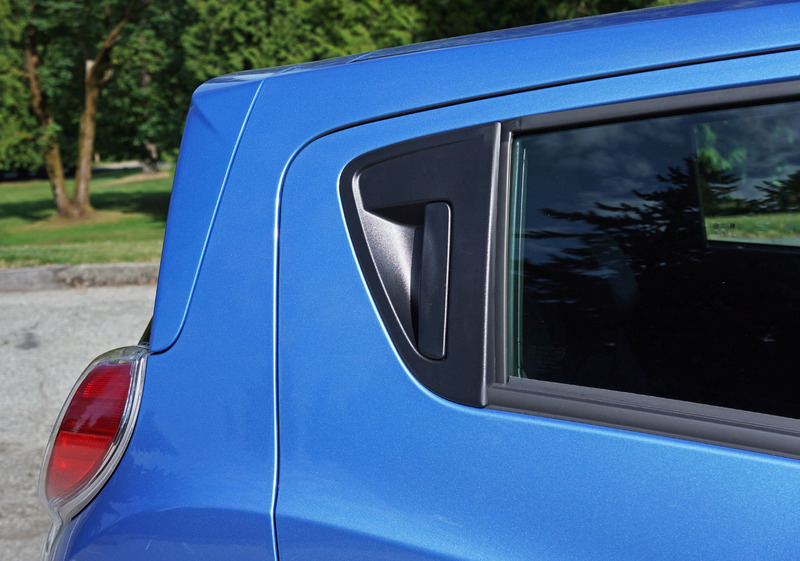 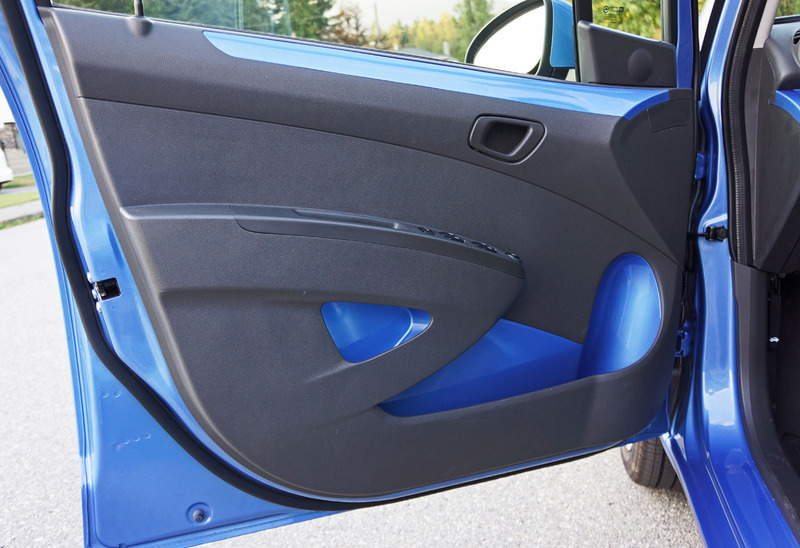 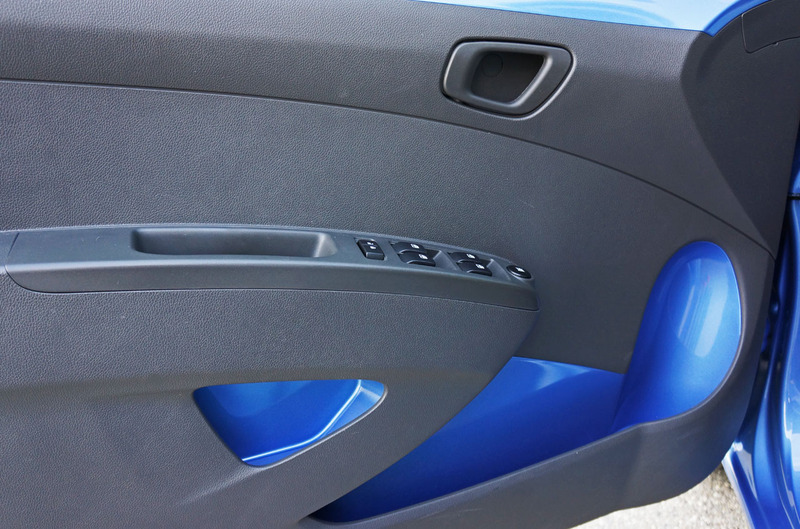 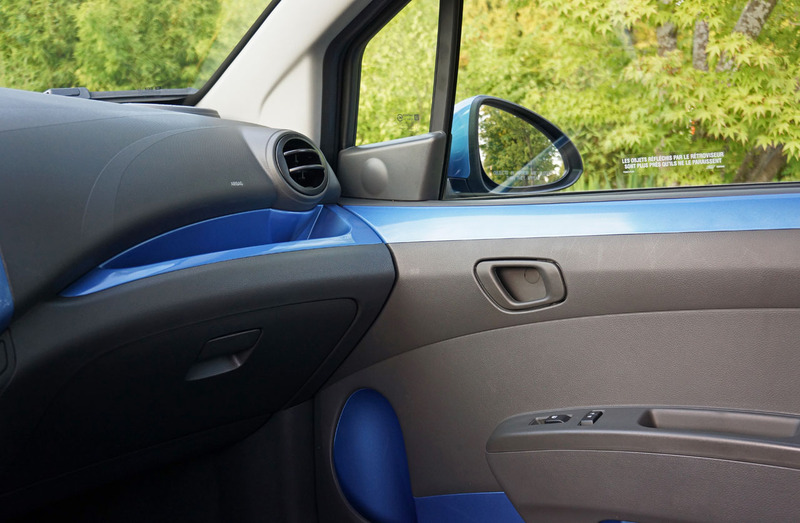 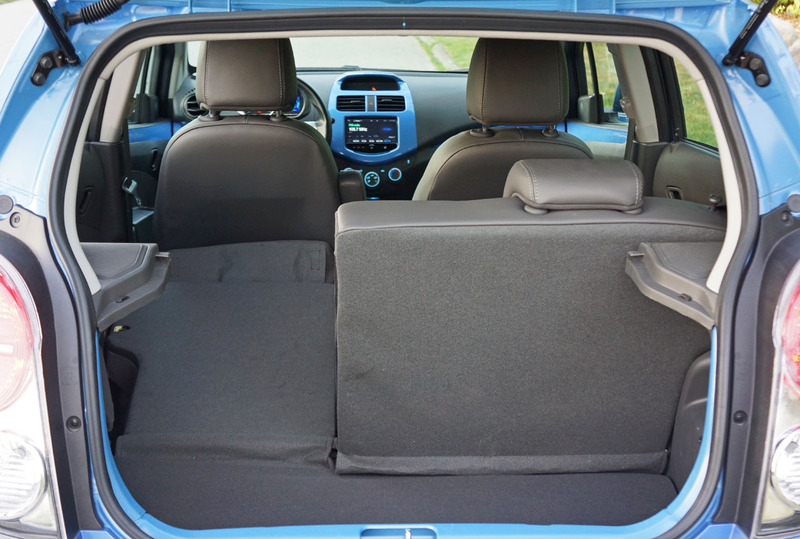 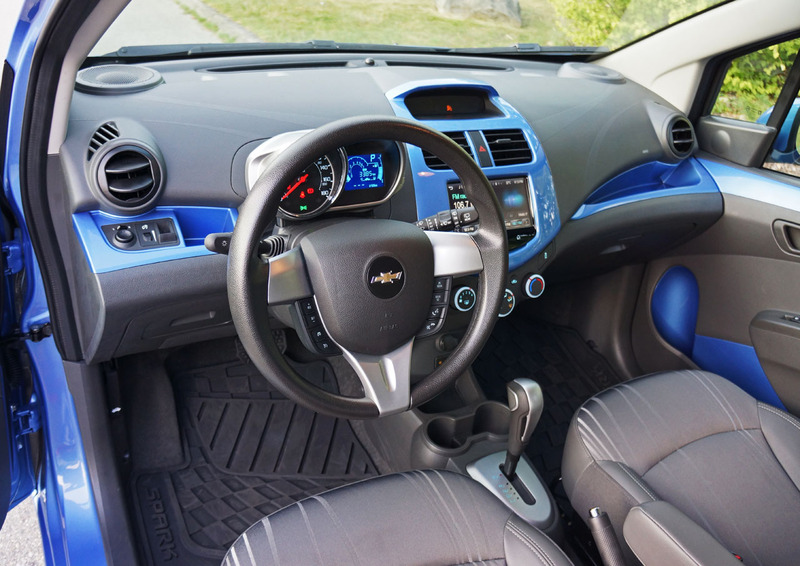 lights, floor mats, and a security system for a very well optioned out little city car. 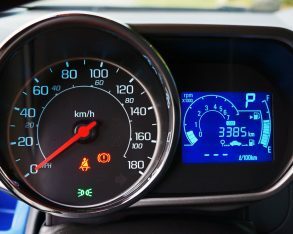 Fuel economy has improved with the automatic, now rated at 6.4 L/100km in the city, 5.0 on the highway and 5.7 combined for the manual or 6.5 city, 5.0 highway and 5.9 combined for the automatic. 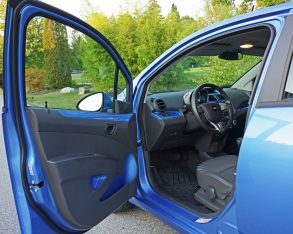 As you’ve likely experienced, Transport Canada’s old two-cycle rating system isn’t very realistic and therefore can only be used for comparison purposes, so it was updated for the 2015 model year. 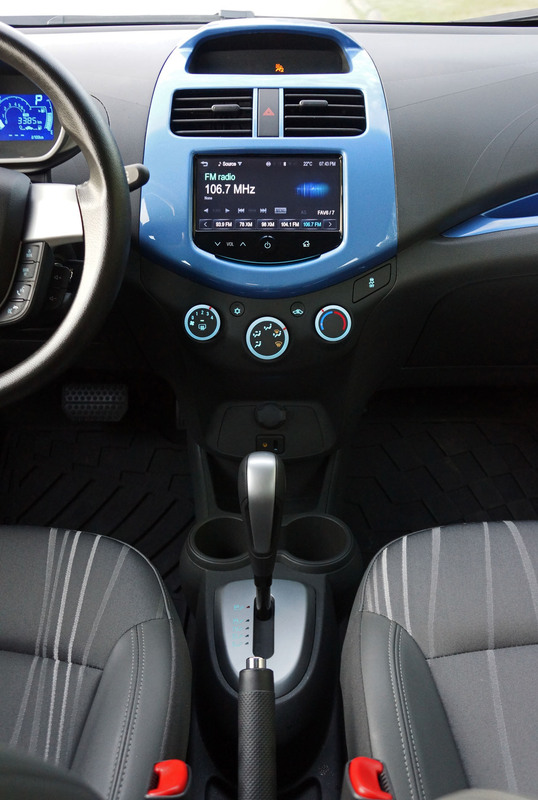 On that note the new 2015 fuel economy figures are a great deal more useful, coming in at 7.5 L/100km in the city, 6.0 on the highway and 6.8 combined with the manual or 7.7 city, 6.1 highway and 7.0 combined with the auto. 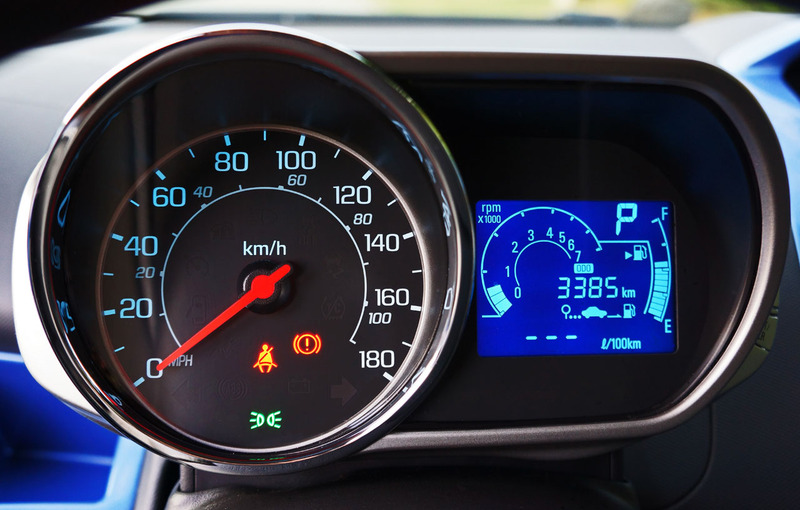 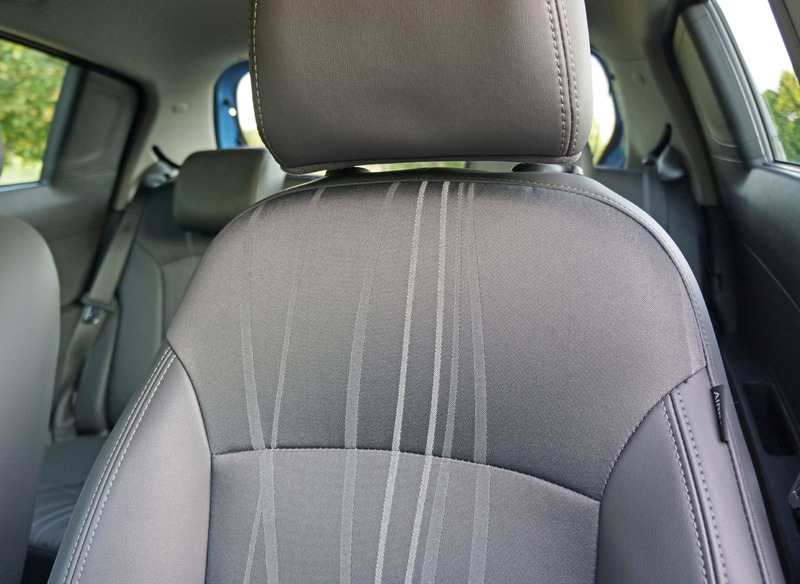 includes 10 years or 160,000 km of powertrain coverage and five years or 100,000 km of comprehensive coverage, but if you’ve been living with a Spark for 10 years and haven’t passed the 160,000 km mark it’s a clear sign that you don’t like your car. 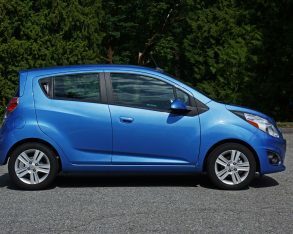 Then again the Spark’s three-year, 60,000 km comprehensive warranty is pretty weak for a Korean-built vehicle, and Chevy had better hope Hyundai doesn’t show up here with its i10 or Eon and likewise Kia doesn’t offer its Picanto (which they really should) as these Korean manufacturers offer five-year, 100,000 km comprehensive warranties across their lineups. 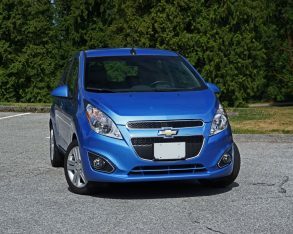 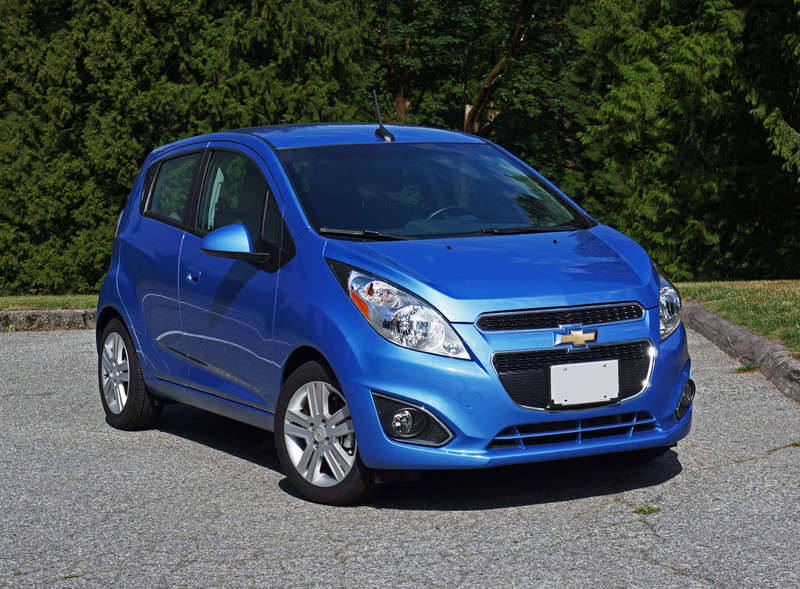 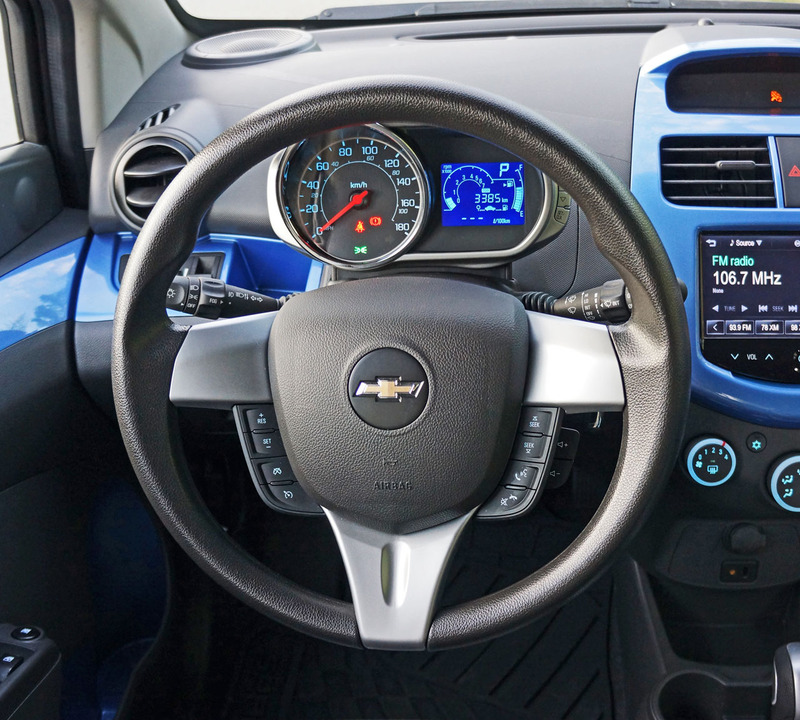 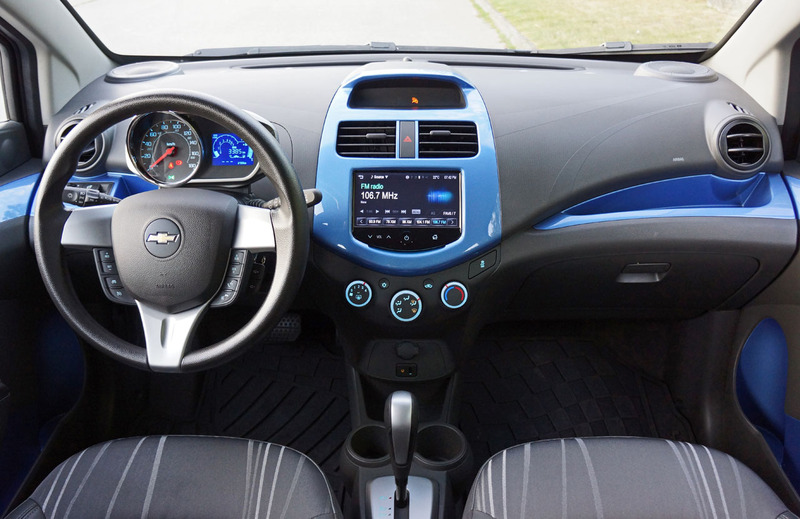 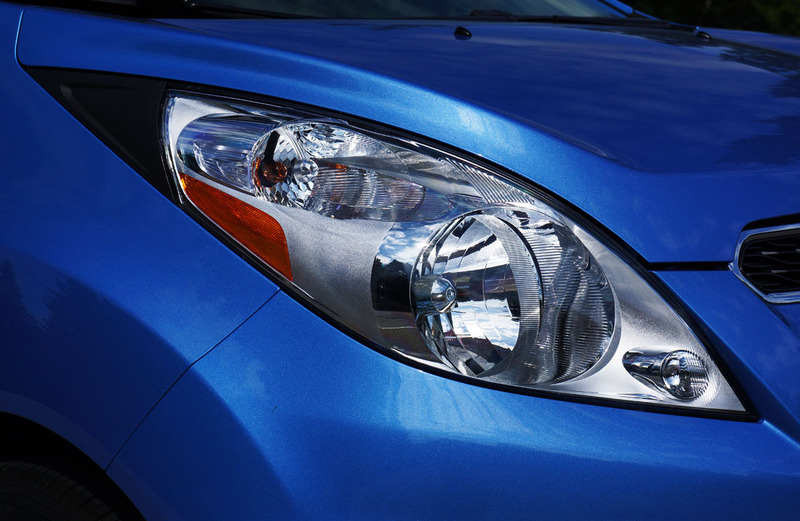 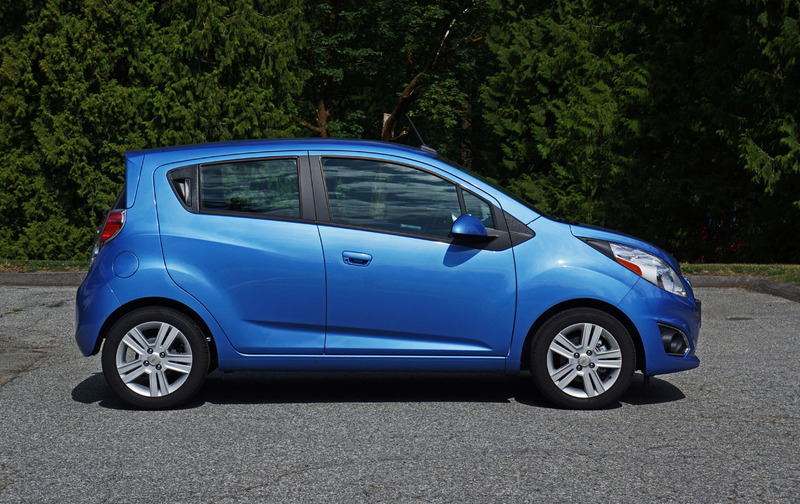 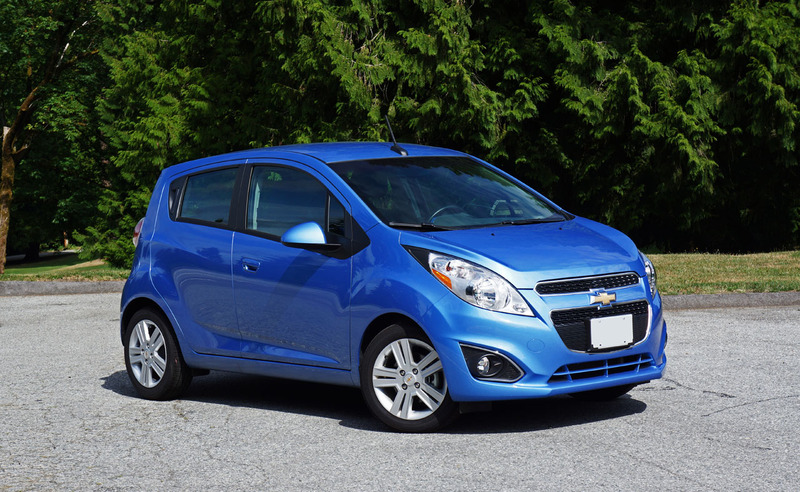 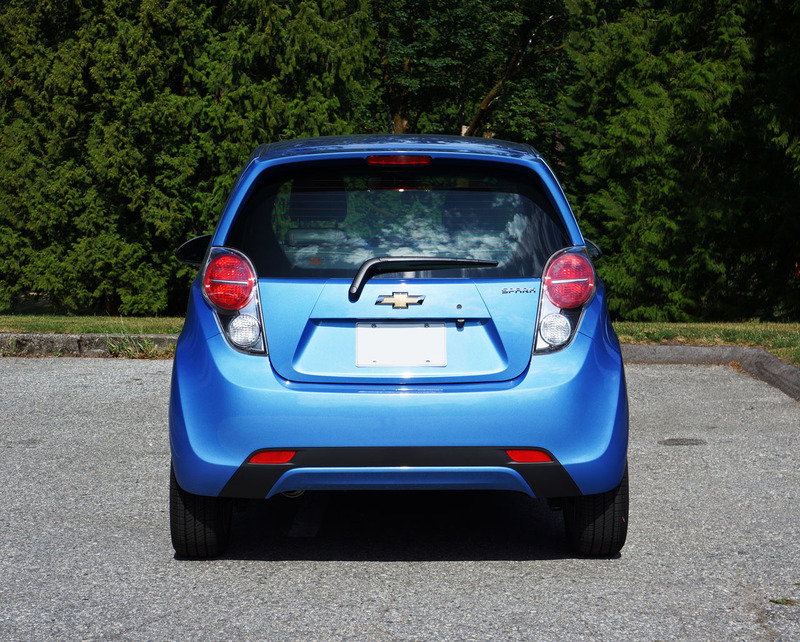 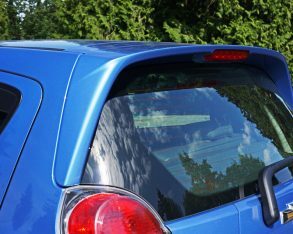 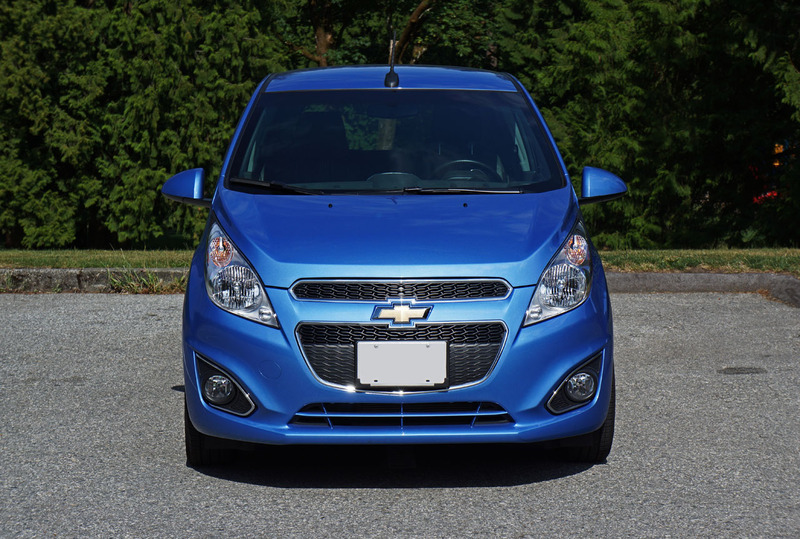 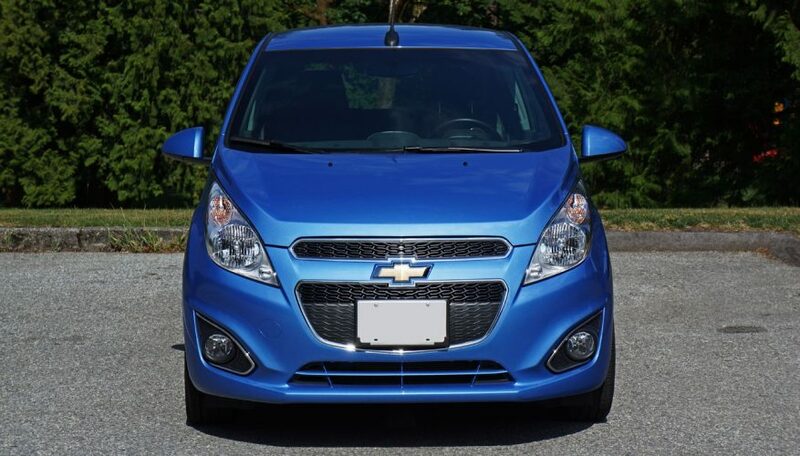 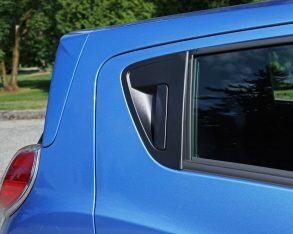 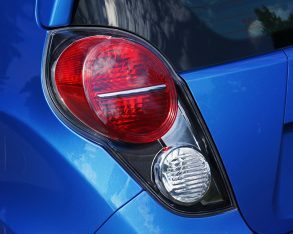 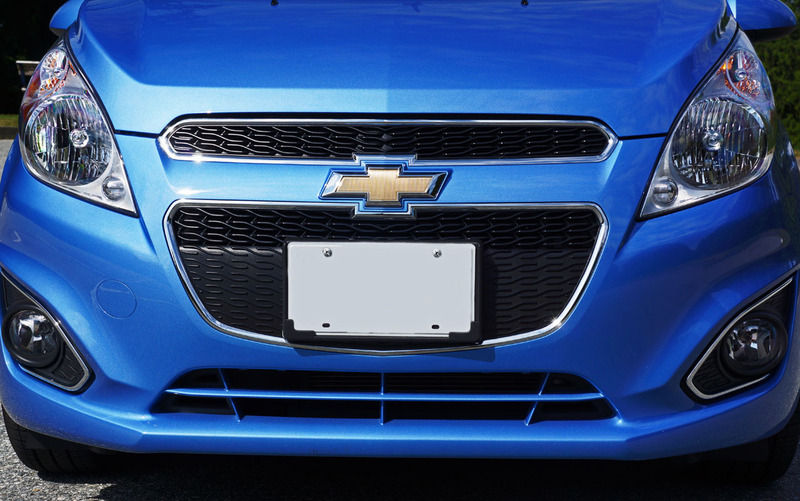 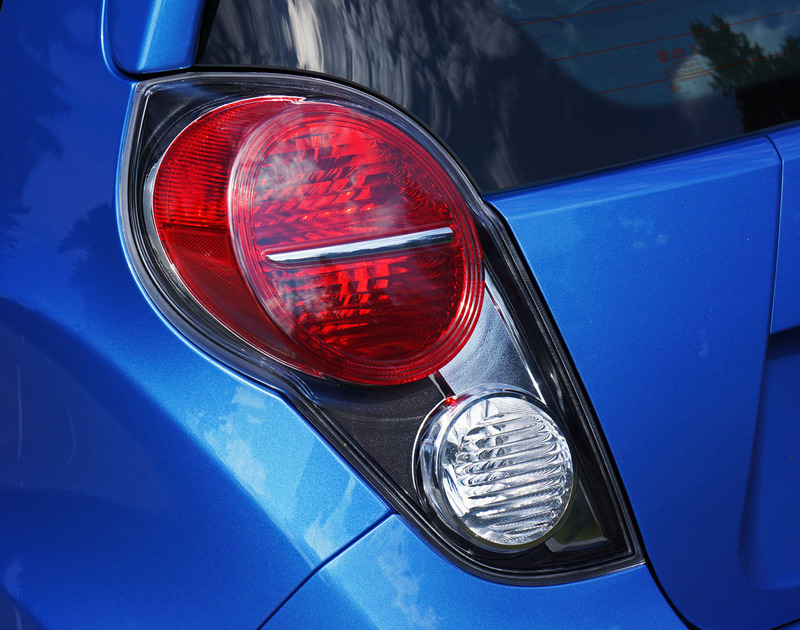 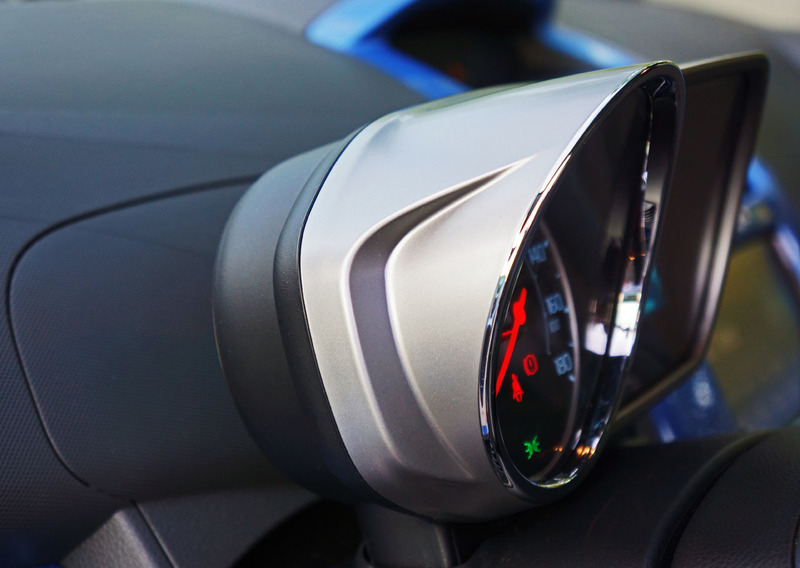 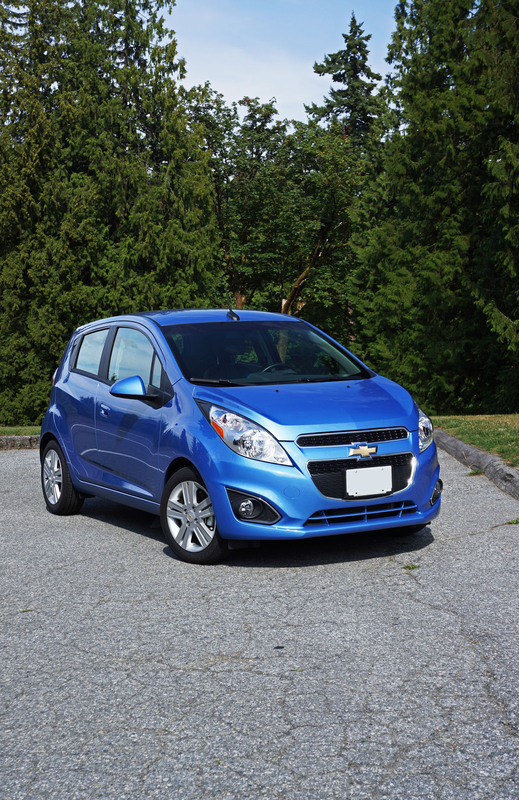 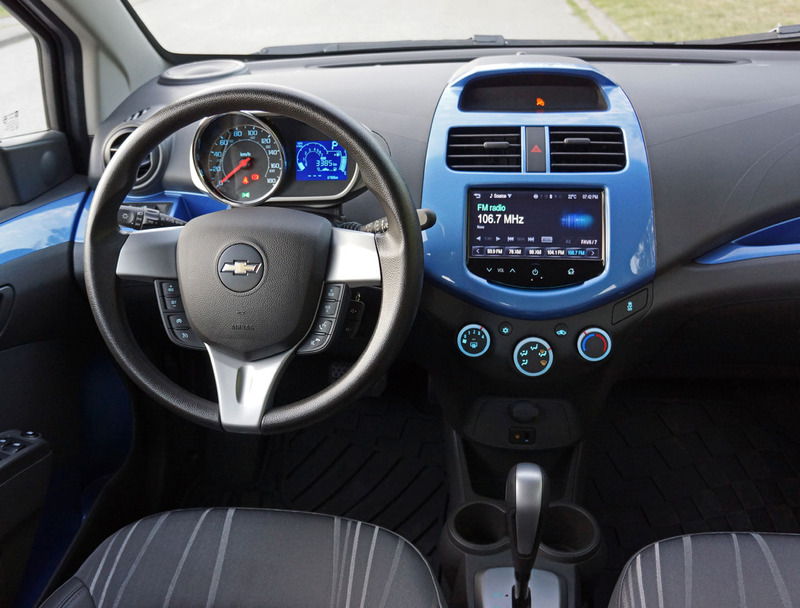 What you get with the Spark is a good little car that’s reasonably fun to drive, fuel-efficient, nicely equipped (especially when it comes to safety features), and fairly well priced in base trim. 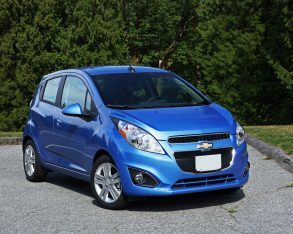 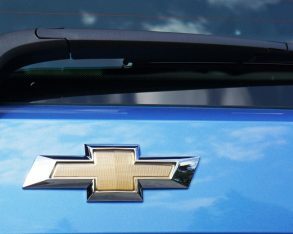 All said, if I were in Chevy’s product planning department I’d nix some of the fancy features and bring the Spark into the country at under $10k so it could do battle with the new Micra and raise the bowtie brand’s stake in the entry-level car market considerably. 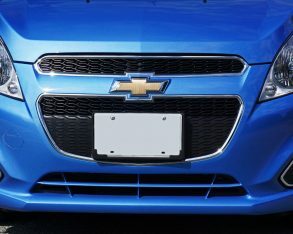 That’s how they sell it here in Manila, and the number of them on the road is a clear sign that the Chevrolet is doing something right.